Can one film ruin a genre? I guess you can look at it from two angles. Did Titanic ruin the Disaster Film genre because no other film could live up to the hype? Or was it possible that Volcano ruined the Disaster genre by having Tommy Lee Jones and Anne Heche (as a geologist!) stop a volcano from destroying L.A.? In 1993, Richard Linklater may have ruined a whole genre with the release of Dazed and Confused, a film about an ensemble of teenagers set on the last day of school in 1976 in Texas. The problem is knowing just what genre it ruined. The slice-of-life film isn't really a "coming of age" film because we don't follow the progression from boy to man of any character. It's closer to a "high school" film but unlike The Breakfast Club, it shuns the simple stereotypical characters and shows a more realistic cross section of kids. The only movie I can think of in the same family tree as Dazed and Confused is American Graffiti. And both have made the teen film genre a difficult place to be in comparison. 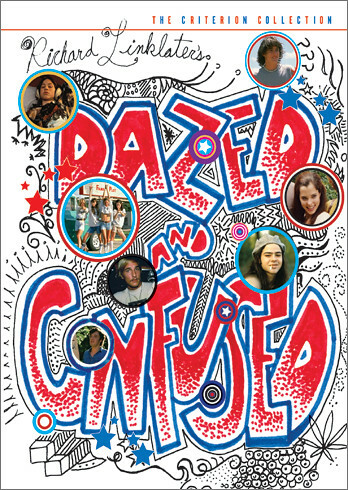 The Blu-ray edition of Dazed and Confused comes out not on any significant anniversary of the film but on the 35th Anniversary of the setting of the film (the Bicentennial). As with any Criterion Collection, proper respect is given as to where this film fits as far as significant Independent and Cult Films of the past 25 years. The film succeeds in setting the razor-thin plot right from the first scene. The orange GTO pulling into the school parking lot has a way of putting me right into the 1976 setting. It's funny because Linklater's 1976 setting in Texas is not far from my experience in the mid-'80s in Michigan. It's not the little touches of the clothing, music (more on that later) and sets that sell me on 1976. Linklater's fixation on the smaller details make the larger things more believable. It's Slater's belt buckle, the drive-in theater, and Mitch's oversized headphones that don't call attention to themselves but give the viewer essential clues. As the GTO pulls into the lot, we learn it's the last day of school and Pink (Jason London) has to decide if he's going to sign his loyalty oath to the football team. The deadline of the next morning gives the movie just the slight dramatic deadline that it needs. The rest of the film falls in as an overlapping series of events from hazing to a baseball game to the school hangout (the Emporium) to a keg party at the Moon Tower. There are easily a couple dozen characters that come and go through our journey. But there's a clear symmetry that makes the experience timeless. It's Pink, the star athlete that has to make the decision to sign the loyalty oath. He's accompanied by his best friend, Don, and his girlfriend, Jodi Kramer. The experience of these Juniors (soon to be Seniors) is mirrored by the group of 8th graders who are about to be Freshman. Mitch Kramer (Wiley Wiggns - sorely underused in films) is the star pitcher on the baseball team and he's got Carl Burnett as his best friend. And while Mitch ends up with Julie on this night, there's a suggestion that the girl of his future will be Sabrina, who he met earlier. The two are linked by the special attention they receive in the hazing incidents (the men receiving physical punishment and the women's being more humiliating). Linklater connects their struggles by showing both in extended slow motion scenes during the hazing. The film really doesn't find its voice in the First Act. There's a clear establishment of setting and the time constraint of Pink to sign his letter. But the hazing incident taken as a whole eats up quite a bit of screen time. It's when the Second Act starts with the movement of cruising that the film also starts moving. The confluence of the Emporium, the Top Notch Burgers, and the cruising leads to mixing and matching of different characters. And there's a realistic feel to the way my smalltown nights went as a teenager. You were with your small group - like the very likable trio of Tony (Anhony Rapp), Cynthia (Marissa Ribisi), and Mike Newhouse (Adam Goldberg) - who seem like genuine friends. We see them interact with other groups along the way including the breakout star of the film Matthew McConaughey as David Wooderson. Every town has to have a Wooderson that graduates and then still hangs around with the high school kids for years, usually talking about his car. The Third Act takes us to the keg party at the Moon Tower. Like the drag race in American Graffiti, Linklater knows that it's not just enough to give the film a time constraint, it's also important to bring our huge cast together to one location. The party is where each of the characters we've been following starts to make decisions about their future. Some are as little as Tony pursuing Sabrina. Or it's a bigger moment like Tony standing up to the bully, Clint. Being a teenager is about the dream. It's a different dream for each one but they have that dream. The "coming of age" story is usually about the end of that dream or changing the dream to a more adult one. But this film celebrates being in that moment. Mitch has caught a glimpse of his future in three years and he's pretty happy with it. Pink knows he could sign the loyalty oath and become a more responsible adult. But he is going to be a dreamer for at least another year and go get tickets to the Aerosmith concert with his friends. I can't finish the review without mentioning the music. Maybe I was wrong earlier. This movie might just be a Rock 'n' Roll movie - an excuse to play all his favorite songs for us. Linklater's choices of songs might even exceed John Hughes and Cameron Crowe as far as setting time and mood. There are hits like Aerosmith's "Sweet Emotion" that set everything in motion. And Foghat's "Slow Ride" that sums up the adventure completely. In between, Linklater's choices are much more subtle. The selection of Nazareth's "Love Hurts" encapsulates every 8th grade dance I ever attended. The song choice that sticks with me the most is Bob Dylan's "Hurricane" as the three generations walk into the Emporium. It's Wooderson, Pink, and Mitch and in the only other slow-motion scene in film other than the hazing scenes. It's the powerful feeling that a teenager has as they walk into a place that they feel like they own. Time slows and you can feel the palpable power in the room - "one night he could have been the champion of the world." The lyrics lifted out of the song perfectly reflect and give depth to the scene. The package from Criterion is filled with extras. The booklet is one of the best. I like the format of short personal essays by other authors and fans more than film critics. And there are excerpts from a companion book released in 1993. There's an original poser by Frank Kozik that is frame-worthy. I didn't find much information to be gleamed from "Making Dazed" (a 50-minute documentary on the film) that wasn't better presented in Linklater's commentary. What's missing is bringing back the cast for a retrospective on their experiences making the film. The 5.1 DTS-HD Audio soundtrack is perfect for a film that relies so heavily on music. Linklater would be appalled probably to put his film up against American Graffiti. The Seventies vibe is different than the Fifties/Sixties vibe. But both films dance around making those decisions to keep dreaming or become an adult. In Graffiti, the solution is to join the Army or go off to college. Their lives are intertwined as they cruise up and down Paradise Road, meeting at Mel's Diner. In Dazed and Confused, Pink knows that decision is ahead of him. But it's a year away and he's going to milk every last bit of fun with his friends that he can. Like Mitch grabbing the bridge of his nose between his thumb and forefinger in frustration, the ensemble don't understand what's ahead of them. But they don't have to. This film has the guts to take that slice of life and celebrate it. This isn't a film for a teenager who's in that moment - it's a film for someone who's older and removed from that situaiton. And for me it's brilliance. well, I am off to get some Sentry work done before I hit the hay.